Wong-Kar Wai’s Chungking Express proved to be his breakthrough movie internationally. 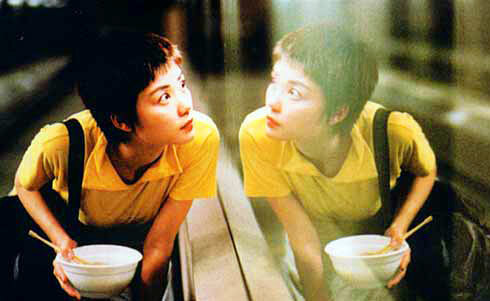 Kar-Wai’s previous film, the elliptical Days of Being Wild (1991) won him acclaim, but was a box-office failure. Chungking Express contains certain genre elements; a femme fatale, a cop, a drug dealer, but Kar-Wai is more concerned with romantic longing. 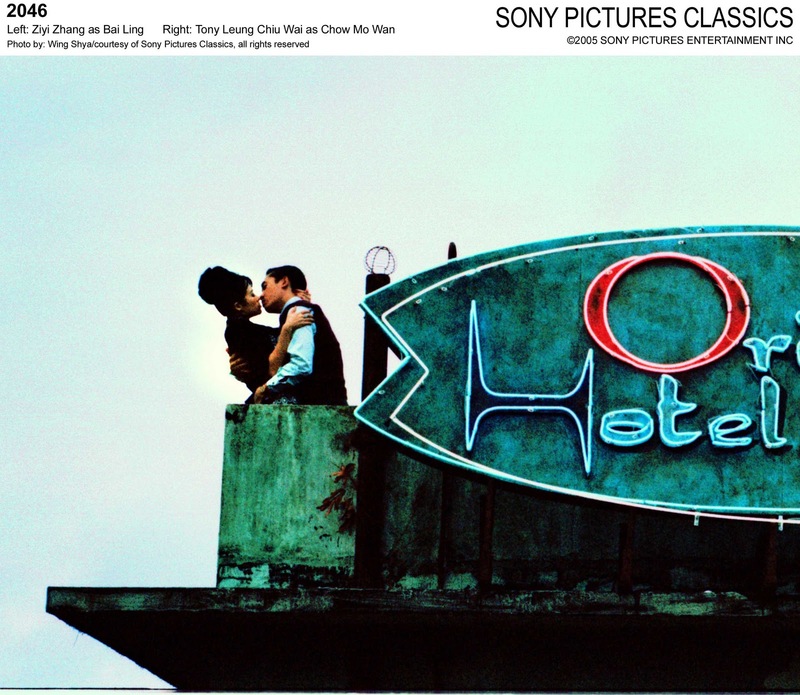 Filmed in and around the Chungking Mansions, a huge residential building in Hong Kong that also contains bars and fast food joints and serves as a meeting point for the city’s ethnic minorities, Chungking Express tells two stories, both about cops and their love lives. Cop No 223 (Takeshi Kaneshiro) becomes infatuated with a mysterious blonde haired woman (Brigitte Lin) he nearly bumps into when chasing a criminal. Cop No 663 (Tony Leung Chiu-Wai) begins a flirtation with an eccentric fast food worker (Faye Wong). 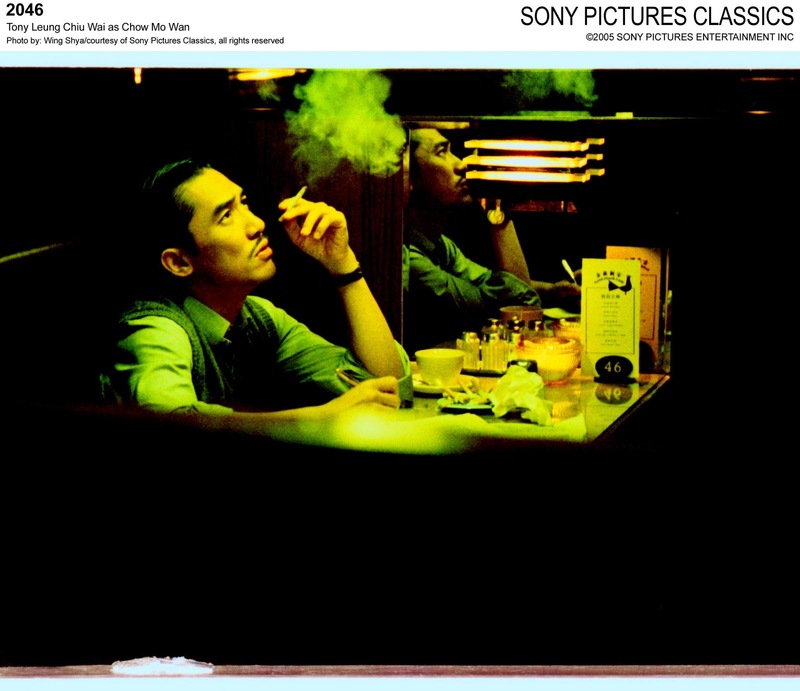 Wong Kar-Wai made Chungking Express while taking time out from his martial arts epic Ashes of Time (1994), a troubled production which went over budget. Chungking Express is the antithesis of the expensive and elaborate Ashes of Time. Together with his cinematographer Christopher Doyle Kar-Wai shot Chungking Express fast and on location. This seemingly improvised style of filmmaking recalls the French New Wave. Doyle makes extraordinary use of artificial lighting in the cramped interiors of the Chungking Mansions. Wong Kar-Wai gives a sense of time moving on, with shots of clocks changing throughout the film, and occasionally speeding up the film so passers by move rapidly past his protagonists suggesting they are out of step with everybody else. The first segment sees Cop No 223 ruminating in voiceover about the break-up of his relationship, loneliness, and the possibility of finding love while he is still young. The first story is noticeably shorter than the second, which makes sense given Kar-Wai intended Chungking Express to be a three part movie.Kar-Wai would eventually film this final storyline as the full-length feature Fallen Angels the following year. As entertaining as the first story is it pales in comparison to the second as Faye (Wong) falls for Cop No 663. Bizarrely, her attraction leads her to break into his flat at every opportunity and to become increasingly hard to get. The boyish figured, wide-eyed Wong is astonishing. It may be that Kar-Wai felt he might as well shelve the third part and concentrate on Wong and her will they/won’t they/what is she doing? jousting with Tony Leung’s bewildered beat cop. Funny, affecting, and rapturous, Chungking Express is the perfect starting point for those unfamiliar with Wong Kar-Wai’s work. Despite being about urban loneliness and heartbreak the film is directed with a lightness of touch that offsets the melancholy. It aches with the possibility that something magical might just be waiting around the corner. This review was written in late 2004 to gain entrance onto a postgraduate course on Film Journalism run by the BFI. It is written in the style of the BFI’s house magazine Sight and Sound. The application was successful. 1966- Chow, a writer, returns to Hong Kong and makes a living selling articles to the local press. Socially, his life becomes a series of parties and one night stands. After an encounter with ‘Lulu,’ a former lover, Chow is inspired to write a story titled after her room number, 2046. On his return, he finds Lulu has gone, so he offers to be the new tenant. 2046 is not ready so he accepts 2047 instead. Street riots in Hong Kong lead to a curfew being imposed, so Chow stays in his room and writes, using his own experiences as the basis for his novel. Bai Ling, a beautiful young woman, moves into 2046. Chow attempts seduction, but Bai Ling resists. A relationship eventually develops, but Chow ends it when Bai Ling asks to spend the night in his room. Miss Wang, the landlord’s daughter is forbidden to see her Japanese lover, so Chow acts as an intermediary. Miss Wang and Chow spend time together working on writing projects. Chow writes his novel from the perspective of Miss Wang’s lover, only to realise he is writing about himself. Chow changes the title 2047 and his novel becomes a science-fiction story about a train that can take people on a journey through their own memories. Bai Ling and Chow meet in a restaurant. Bai Ling gives him the money to pay the bill. Back at her apartment Chow returns her money and walks out on her. Chow’s voiceover informs us 2046 is a place no person can return from. “Why can’t it be like it was before?” asks Bai Ling (Zhang Zhyi) of her emotionally distant ex-lover, a feeling that might also be felt by fans of Wong Kar-Wai’s In the Mood for Love (2000) to which 2046 is a sequel. Pulled from the Edinburgh Film Festival at the last moment by the director so he could re-edit, 2046 has built up such a high level of expectation it is difficult to see how it can satisfy. Especially as on a first viewing it is far more elusive than its predecessor. Ever since Days of Being Wild (1991) and through films like Chungking Express (1994), the martial-arts epic, Ashes of Time (1994), Fallen Angels (1995) and Happy Together (1997), Kar-Wai has created films evoking a particular mood of romantic despair. Essentially about the writing of a novel entitled ‘2046,’ the film works best as mediation on memory and how the past experiences can have a profound effect on a person’s behaviour. “All memories have traces of tears,” says the narrator of Chow’s novel. Chow uses a science-fiction story as a metaphor for his own emotional isolation and his retreat into the comfort of writing. 2046 becomes a state of mind formed by romantic loss. It is the inability to move on, instead focusing on what has been lost and reliving those moments, either in the mind, or by re-creating the relationship with other people. Chow (Tony Leung Chui-Wai) ended In the Mood for Love amongst the ruins of the Cambodian temple at Angkor Wat having followed a Chinese tradition of whispering away a secret. In the final shot Tony Leung has an expression combining hurt with anger, as if Chow has whispered away part of himself and is now as desolate as his surroundings. 2046 is set a few years after this moment and Chow has become a cynical womaniser. Despite his attempts to treat his affairs as nothing more than pleasurable activities, Chow finds himself reminded of his relationship with Su Lizhen (Maggie Cheung) from the previous film. Chow take another lover called Su Lizhen (Gong Li) and gives her a passionate farewell both know is really meant for the other woman. Miss Wang helps with his writing as Su Lizhen did, but nothing beyond friendship develops between them. A recurring sequence in In the Mood for Love saw Chow and Su Lizhen in the back of a taxi, with intimacy growing between them each time it is replayed. There is a similar sequence in 2046 with Chow and Bai Ling, only this time he is fast asleep and it is only her who is falling in love. Sequels are often accused of simply repeating a storyline, but Wong Kar-Wai may find himself being criticised for making a film that is too different from the original. Those hoping to see Maggie Cheung paired together with Tony Leung again may be disappointed by her brief wordless appearances here. But Cheung’s lack of screen time suits the film, with her absence haunting the narrative, just as her absence haunts Chow. It would make little sense in trying to replicate In the Mood for Love’s rapturous love story. 2046 is about what happens afterwards, the bitterness of regret and the painful memories left for those who cannot move on.